Say goodbye to your chocolate craving when you bite into a crunchy and rich King Size Cookie Layer Crunch Triple Chocolate bar from Hershey’s! 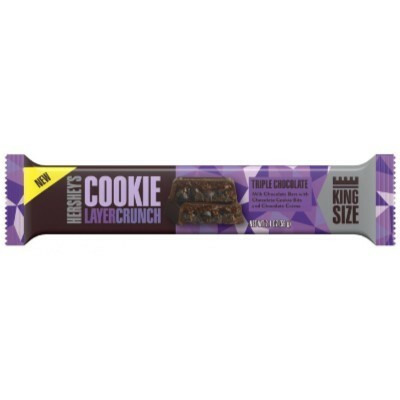 It features a full-flavored milk chocolate shell that encases a combination of a smooth chocolate creme with the crunchy texture of crisp chocolate cookie bits. The King Size means there’s even more bar to enjoy, so get your chocolate fix today! Milk chocolate (sugar, cocoa butter, chocolate, skim milk, milk fat, lactose (milk), cocoa processed with alkali, lecithin, natural flavors), sugar, enriched wheat flour (flour, vitamins B3-B1-B2-B9, ferrous sulfate (iron)), palm oil, cocoa processed with alkali, whey, 2% or less of: skim milk, chocolate, milk, lecithin, salt, acidity regulator E500ii, natural flavors. Contains GMO. Nutrition facts (for 100g): calories 525Kcal, total fat 32.2g (saturated fat 18.6g), total carbohydrate 57.6g (sugar 45.8g), protein 6.8g, salt 0.6g.